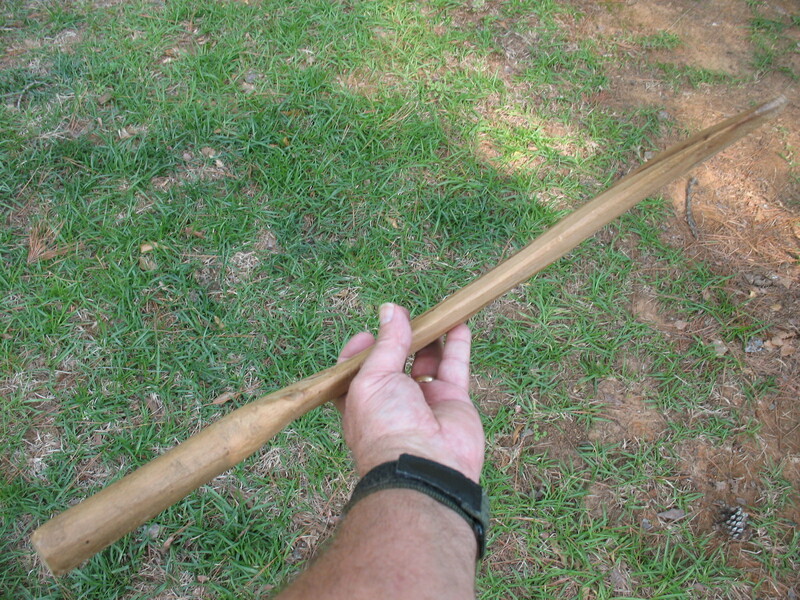 Primitive hunting cultures took the idea of the throwing stick and made improvements to it that turned it into a more effective hunting tool. We call the Australian version a boomerang and the Native American version a rabbit stick. They are both basically the same weapon. By the way, the Australian hunting boomerang does not return when thrown. A stick that flies in a circle would be awfully hard to hunt with. 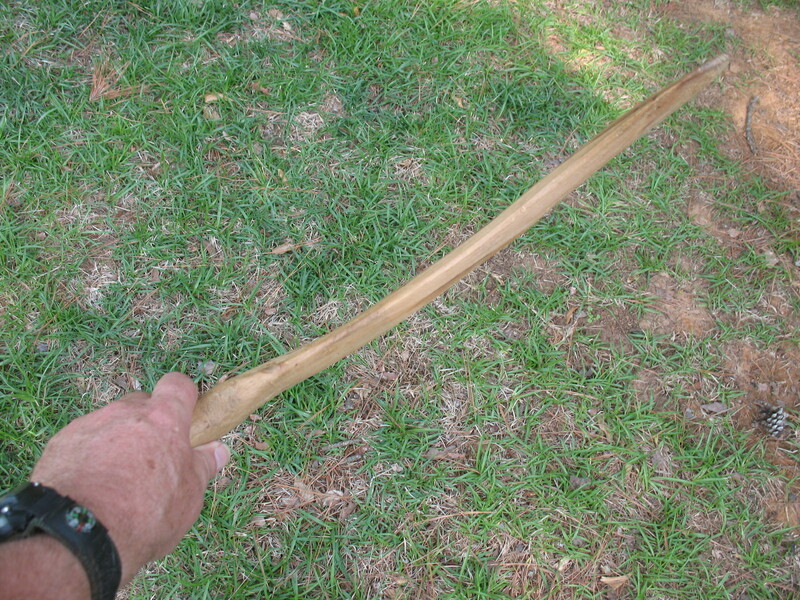 To start off making a boomerang you will need to do a little searching for just the right piece of wood. You need to find a tree limb that is about three inches in diameter and has a nice natural curve in it. It is best to use hardwood, and it needs to be fairly knot free. When you have located a good limb, cut about a three foot section of it with the curve centered as nearly as possible. You won’t use the whole three feet for your boomerang; but the ends may split a little when drying, and it doesn’t hurt to have a little extra wood to work with. Put your limb up in a warm, dry place and let it season for a few weeks. When the wood is dry it is time to go to work. Unless you are willing to do a lot of whittling, it is nice to have an axe to get you started on roughing out a boomerang. 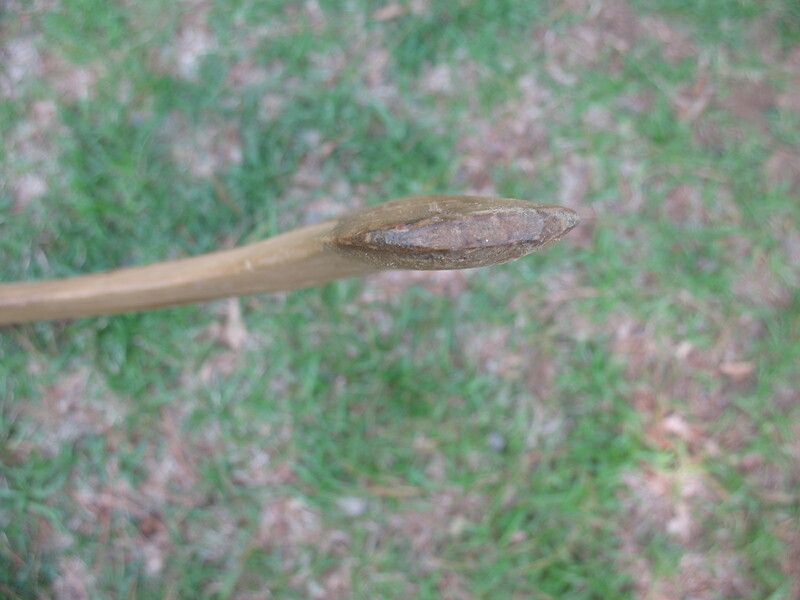 Rough out your boomerang by thinning down the top and bottom of the limb to a thickness of about one inch. Leave the blade of the boomerang the full width of the limb. When you have finished with this process you should have what amounts to a one inch thick by three inch wide board with a curve in the middle. Now you can take your knife and finish out the final shape of the boomerang. One end needs to be narrowed down and rounded off to form a handle. The length of the blade should be left one inch thick in the middle, and tapered down to a rounded edge on each side. Don’t make the edges too thin or they will be damaged when the boomerang smacks into a rock or tree. A little scrapping with the edge of your knife will smooth out the finish and make it look nice. 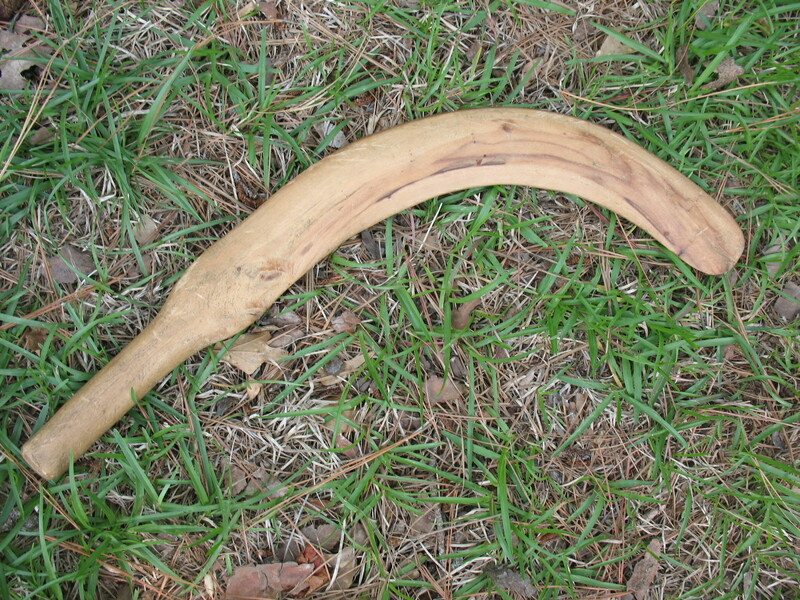 I like to rub my boomerang down with some grease or vegetable oil to give it a nice finish and help protect the wood.